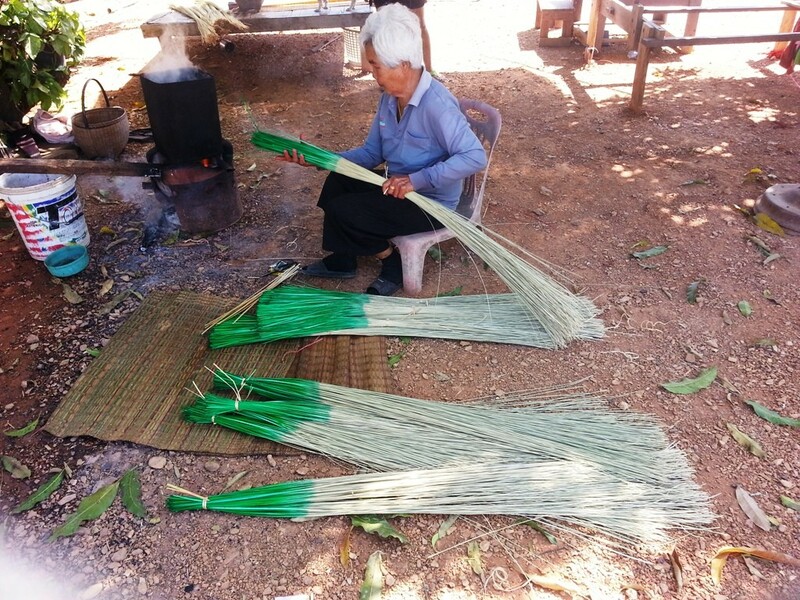 Ladies can be seen weaving grass mats using hand looms in many villages in Thailand. The one featured here was woven in the village of Khok Prong in Wichian Buri, a district in the Phetchabun province in Northern Thailand. This was done on the patio of a family home and is typical of what can be seen every day in the smaller villages. 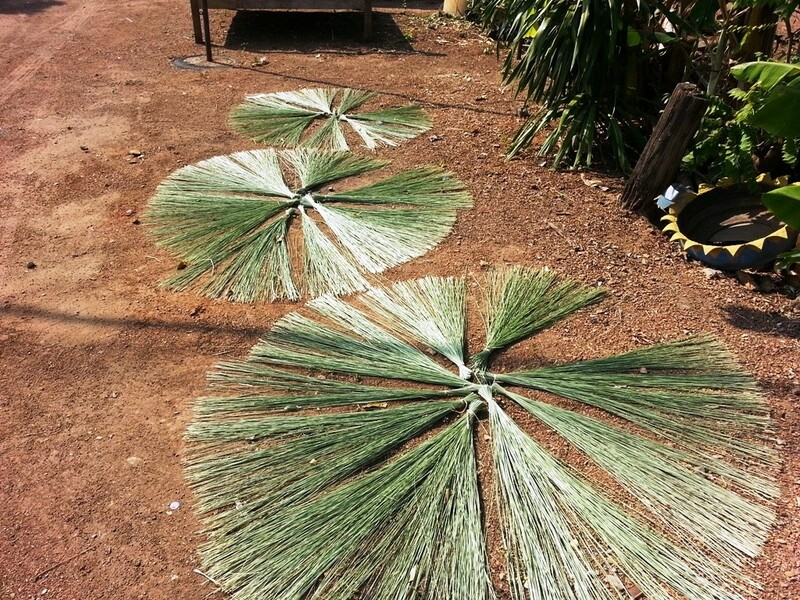 Firstly the the papyrus grass needs to be planted, cultivated and harvested, This is done in commercial quantities in places like Bang Sa Kao, however it is common to see papyrus growing in the yards of houses in many villages. 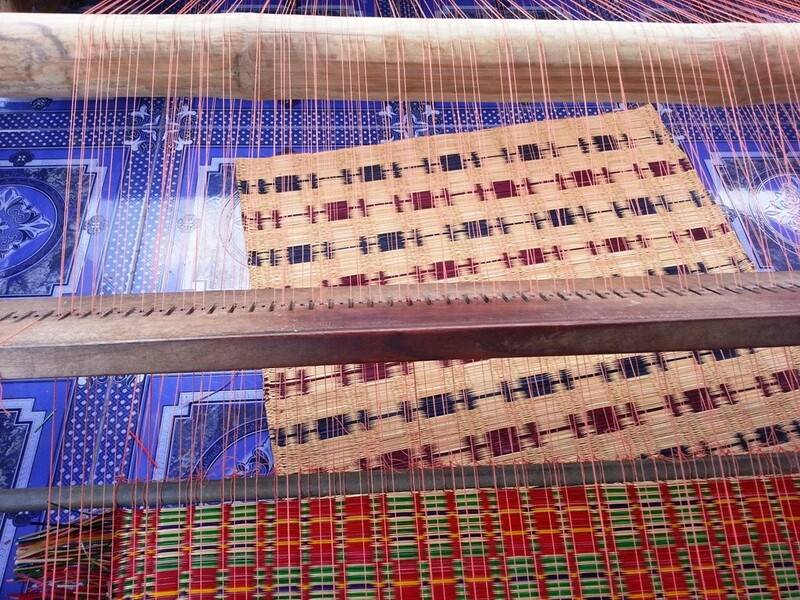 The following video shows several generations of the same family involved in the mat weaving process. The video shows the great grandmother dyeing the reed, assisted by her granddaughter. The youngest lady that is trimming the base is the great granddaughter of the lady dyeing the reed, and the two ladies doing the weaving are two sisters, both grandmothers. Once the papyrus is semi mature, it is harvested, trimmed and split. The video below shows the trimming and splitting. It is then laid out to sun-dry, in this case in the yard close to where it was grown. It makes the dyeing process easier if one end is dyed and tied so the entire bundle can then be immersed in the boiling dye. 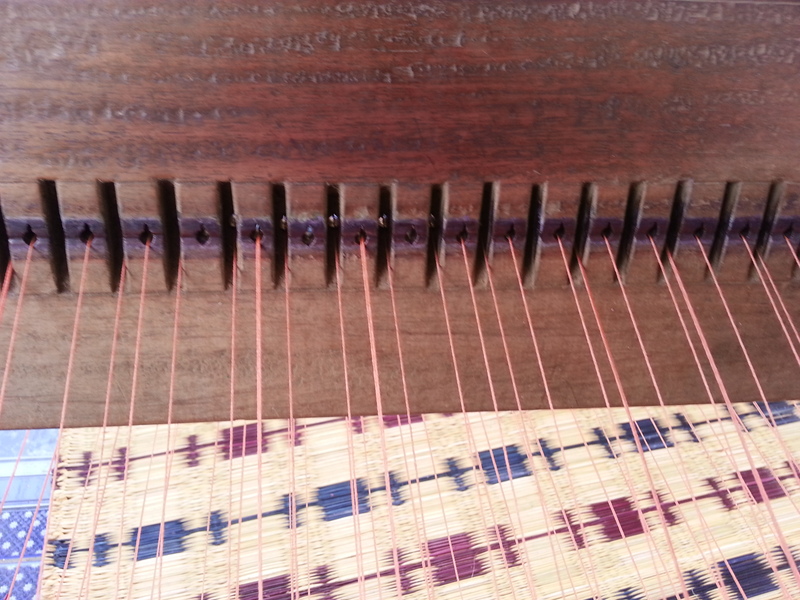 When you watch the video, take note of how the main beam of the loom is tilted in alternate directions for each piece of reed. The video below shows highlights of the entire process which spanned several days including the preparation, drying, dyeing and weaving. Each stage mostly required two people with the weaving starting early to mid morning and finishing in the late afternoon. I would estimate that the total hours involved in weaving this mat would be about 10 hours for two people. Although this mat was made for personal use, you can quickly see that the cottage home industry could not compete on price with mass manufacture. In many cases the only way for these cottage industries to survive, is to rely on the added income from the tourist trade that is willing to pay a little more for the genuine home made product. Enjoy the video and any comments or questions on weaving grass mats are welcome. If you are unable to join us for a tour, but would like to see a similar process the map below shows the directions to the Mat Weaving Village of Bang Sa Kao.